As I stepped off the airplane in Cap Haiten a wave of excitement spread over me. It had been a dream of mine to be part of a global health trip since junior high school and it had finally come true. Getting through customs was incredibly hectic. We were a group of 10, with 2 bags each (filled to the brim with medical supplies) and a language barrier. Thankfully our team leader had been to Haiti multiple times before and was a professional at navigating the small but busy airport. Once outside, we were greeted by our hosts with hugs and words of appreciation for the work we would be doing all week. We then piled into a van and began our long drive to the guest house we would be staying in. My first glimpse into the local reality occurred during this close to 3-hour long drive along bumpy unpaved roads. The country’s beautiful greenery and clear blue skies were juxtaposed with crumbling buildings and piles of trash covering its beaches. 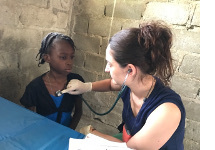 The Haitian people were friendly, open, and engaging but uneducated about sexual health and unaware of common medical conditions, which led to high rates of teen pregnancy and mortality from easily treated conditions. During each day at clinic I was shocked and overwhelmed by the sheer amount of patients that needed my help. I rejoiced each time I made a visual diagnosis and was able to provide the correct treatment, and sympathized with each parent’s sorrow and confusion when their child’s diagnosis was not clear. I provided reassurance, education, counseling and short term supplies. I handed out multivitamins, prenatal vitamins, anti-hypertensive pills, antibiotics, and antifungal creams. I cleaned wounds, sutured lacerations, administered developmental assessments, and screened for malnutrition. I am extremely proud of the work I was given an opportunity to do in Haiti, but I understand that we must continue to send in medical teams to provide the necessary care and refill the needed supplies. It would be an honor and a privilege to return to Haiti in the future to continue to educate the population on preventative care and hopefully establish a medical care system that is permanent and effective.